Micro blogging and social media site Twitter has redesigned its Twitter for Android App to give it a new look and feel. The new material design adopted offers a new experience to users in terms of sharing, exploring and connecting to people. The new design according to twitter’s official blog comes with three main functionalities. 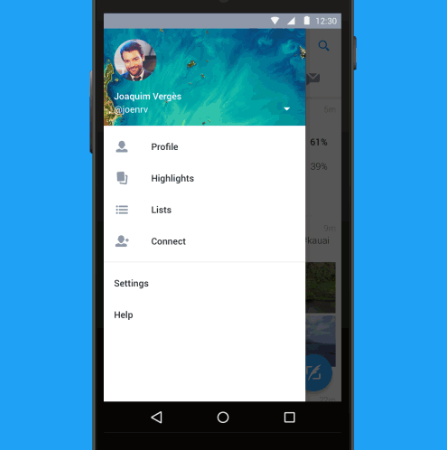 The new material design of the App offer users easy means of sending tweets using a floating butting on the App. It also comes with a navigation menu sliding from the left to give a quick access to your profile, highlights, lists, the connect tab and settings. Finally the new Twitter for Android App also has a tab bar at the top of the screen, with which users can easily swipe between Home timelines, notifications, direct messages and more. 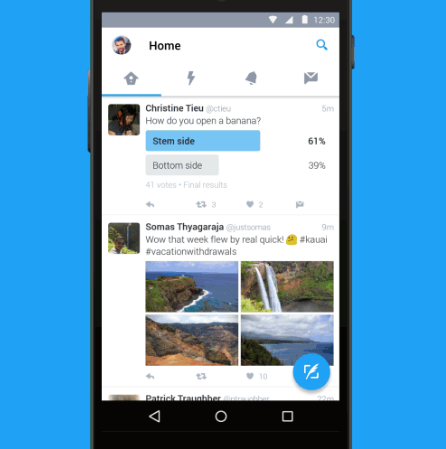 The new Twitter for Android App is currently available to all Android users in the world with just a simple update.